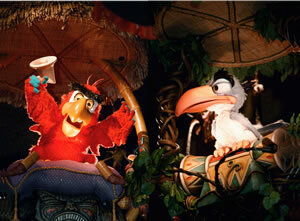 Audio-Animatronics technology features heavily in many of the attractions at Disney parks around the world. Imagine Pirates of the Caribbean ride without all of the Audio-Animatronics figures, or the Haunted Mansion without it’s ghostly residents. But where did it all begin? 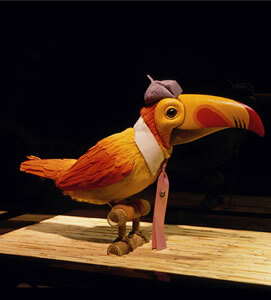 It was in the early 1950s that Walt Disney purchased a mechanical bird while he was on vacation in Europe. That souvenir spurred Walt on to give life-like movement to 3D figures, just as he’d given life to the characters in his animated films. In 1951 Roger Broggie and Wathel Rogers began work on “Project Little Man,” a miniature 9-inch tall figure programmed to mimic vaudevillian tap-dancing routines, using cams, cables and tubes. The technology was primitive and movement limited, but when Imagineers combined the cam-and-lever principle with an electronic-hydraulic-pneumatic approach, they achieved greater movement in the figures which were used in two of Disneyland’s early attractions, Nature’s Wonderland and Jungle Cruise. The first true Audio-Animatronic technology was used for the birds in The Enchanted Tiki Room at Disneyland, which opened in 1963. for this the Imagineers had devised a system to control the actions by means of magnetic recording tape and solenoid coils. The signals recorded on the tape triggered solenoid coils inside the figures, producing action. By 1964 the first fully animated human figure had debuted at the New York World’s Fair. That figure was Abraham Lincoln, and it incorporated 57 moves, including 22 different head movements. But the work had been painstaking and involved animator Wathel Rogers being rigged up with a harness-like device and his every movement captured and recorded. The programming harness was a precursor of the motion capture systems that are used today. 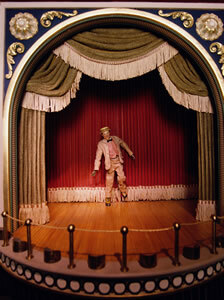 A duplicate of that Abraham Lincoln Audio-Animatronic figure went on to be used in the Disneyland attraction Great Moments with Mr. Lincoln which opened in 1965. The 1964 film “Mary Poppins” saw the appearance of two Audio-Animatronics birds, Robin and Umbrella, and the profits from that film were used to invest in an organization, MAPO, set up to create Audio-Animatronics figures. The Digital Animation Control System (DACS) came into being in 1969, making use of the now rapidly developing computer technology. DACS involves the movements being recorded onto computer disk, which animators then use to manipulate the figures’ movements via a console. Using this system the animators are able to adjust or delete actions at the touch of a button. DACS technology has moved on a long way since then, and a more sophisticated version is now used to control all of the Audio-Animatronics figures we see at the parks today. All of the Audio-Animatronics figures in Epcot and Magic Kingdom at Walt Disney World are controlled from a system composed of multiple DACS from a single remote location in the Magic Kingdom. 1989 saw the first A-100 Audio-Animatronic figure in the form of the Wicked Witch of Oz at Disney Hollywood Studio’s Great Movie Ride. The A-100 figure enables movements and gestures that the figure makes to be more realistic than ever before, and it takes around eight hours to animate just one second of movement. Meeko was the first portable, all-electric Audio-Animatronics figure, and made his debut in 2002 in Animal Kingdom’s Pocahontas and Her Forest Friends show. 2004 saw a huge step forward with Lucky the Dinosaur, the world’s first free-roaming Audio-Animatronics figure. Lucky made his debut at Disney’s California Adventure park and was able to roam around interacting with guests. This technology continued to evolve with the appearance of the Muppet Mobile Lab at Epcot, which saw much smaller versions of the free-roaming Audio-Animatronics characters, that were not only able to move around, but could also converse with each other as well as with guests. These days Audio-Animatronics figures can be found in many Disney rides and shows, including an A-100 Captain Jack Sparrow in the Pirates of the Caribbean attraction, an 18 feet tall yeti in Animal Kingdom’s Expedition Everest, and the most complex A-100 figure to date in the form of Stitch at Magic Kingdom’s in Stitch’s Great Escape. The newest Audio-Animatronic figure to feature in Disney attractions, both in California Adventure and Disney’s Hollywood Studios, is Mr. Potato Head in Toy Story Mania! This figure is so advanced that he can remove and re-attach his ear, has lips with a wide range of movements and his eyes are digitally animated so he is able to look directly at a guest he is talking to. 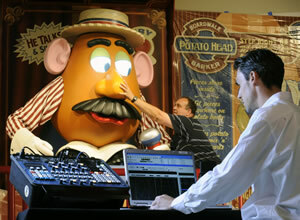 The figure took more hours to program than any other Audio Animatronic figure ever has before. It’s difficult to imagine what possibilities lie ahead, but I’m sure that Imagineers and animators have something even bigger and better already on their drawing boards. A walking, talking life-like Audio Animatronic man could be just around the corner. I used to work in the DACS department with Mel Black and Warren Sheldon. Warren and I had worked for Astrodata which was the maker of the first computer anamation system for W.E.D. Enterprises. I worked from August 1970 to December 1974 in Dacs. Mel, Warren and I had our name on the Disney World People Mover ride patent. It was fun and it was hell too. Your commentI would love to meet with the people that built these wonderfull machines. I am trying build one of these myself. But I would like to build the older type. A Once-in-a-lifetime event will celebrate animatronics mechanical magic, from the shores of the jungle cruise to monorail beams, pirate ships, and beyond! This September 18th 2010, Ape Pen Publishing and the 1313 Club will host a dinner gala celebrating the marvelous mechanical story of the animated figures which populate such beloved places as The Disneyland Resort and themed venues around the world. Beginning with simple motorized figures and leading to the development of Audio-Animatronics that revolutionized the industry, this event will celebrate these marvels and the history of their development. We’ll present the Walt Disney Company’s incredible mechanical achievements by spotlighting attractions, characters, and memorable devices created for their theme parks worldwide. Disney Legends including; Bob Gurr, Alice Davis, and Xavier Atencio, (some of whom worked at the innovative MAPO division of WED/Walt Disney Imagineering) will be on hand to share their stories. Presenting rare images, video, and authentic props and animatronics, guests will gain insight into the fascinating MAPO division and world of animatronics as never before. Renowned audio animatronics creator Garner Holt of Garner Holt Productions will shed light on this little known but highly intriguing aspect of theme park history as he shares some of the most advanced AA figures in the world today. This once in a lifetime evening will honor the Disneyland Resort as one of the world’s premiere storytelling environments, with special emphasis on its technological wonders. Combining history, entertainment, and lots of surprises, it’s an event not to be missed by any Disney or audio animatronics enthusiast! Special guest appearances include: The voice of Walt Disney’s original Alice In Wonderland; Kathryn Beaumont, Disney animator Floyd Norman, former Imagineering AA figure programmer; Darin Hughes, The Doom Buggies, Kirk Wall, the original Golden Horseshoe Review Can Can girls and many others! Plus special performances by Disneyland Resort entertainers, displays, ride vehicles, a silent auction, limited edition merchandise, and the premiere of the world’s most advanced audio animatronics figure! The fight to get the birds working was immense, they first tried some kind of electric motor but the birds burst into flames. Then they tried pneumatics (air) and the triggering mechanism was not mag tape to start but a stack of discs with notches cut in them and cam followers. Not sure on timelines or specifics, but you might find some of those MAPO folks to talk about it.